Metal braces are an effective yet often inconvenient way to straighten your teeth. Why \suffer through years of wearing uncomfortable, unsightly metal braces when there are other orthodontic treatments that are just as effective? Here are some popular alternatives to wearing traditional metal wire braces. The Invisalign® system makes undergoing orthodontic treatment much easier and more convenient than traditional metal braces. The patient simply wears the Invisalign aligners, switching to a new set every two weeks. As the patient wears the aligners, the teeth slowly start to shift into place. One of the main reasons so many people choose the Invisalign system is that the aligners are virtually invisible. For image-conscious teens and adults, the Invisalign system provides a way to straighten one’s teeth without an embarrassing mouth full of metal. 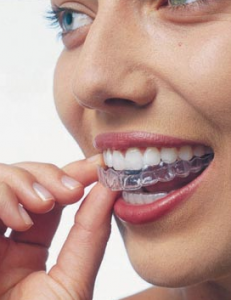 Invisalign aligners are custom-created for each patient and are made out of clear, smooth plastic. Many patients find them much more comfortable to wear as opposed to metal braces, which can irritate the cheeks and gums. Invisalign aligners can be removed for eating, brushing, and flossing. These tasks are much easier without metal braces getting in the way. The Six Month Smiles® program is designed to straighten your teeth in just six months – less than half the time it takes to complete treatment with metal braces or Invisalign. Using clear brackets and tooth-colored wires designed to be inconspicuous, the Six Month Smiles program quickly shifts teeth into place for a straight, attractive smile. Unlike other orthodontic treatments, Six Month Smiles does not correct bite issues. Instead, this treatment is cosmetic in nature, focused solely on the teeth that show when you smile. Because only minor movements are being made, this treatment is often much more comfortable than metal braces. Six Month Smiles requires just one office visit each month during treatment, making it a convenient choice. Porcelain veneers are not an orthodontic treatment, as they do not shift the location of the teeth. 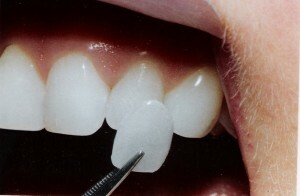 Rather, veneers simply give the appearance of a straight smile by covering any crooked teeth. Patients are able to be part of the process by choosing the size, shape, and shade of the veneers. Though also not an orthodontic treatment, as the teeth are not actually moved, a Snap-On Smile® appliance can be a fast and convenient way to give the appearance of straight teeth. The Snap-On Smile appliance is custom-created for the patient, enabling him or her to decide what the smile will look like. Snap-On Smile is simply slid over the gums to give the appearance of a perfect smile, and it can be removed at any time. For patients who want a straighter smile without the uncomfortable inconveniences of metal braces, there are several different choices, including the Invisalign system, Six Month Smiles, porcelain veneers, or Snap On Smile. If you are unhappy with the appearance of your smile and are ready to do something about it, schedule your free consultation with Dr. Riaz Rayek at Smiles at Fairfax Corner. Stained Teeth Treatment: Is It Worth a Trip to the Dentist?